•Prep: 15 min. - Total: 35 min. 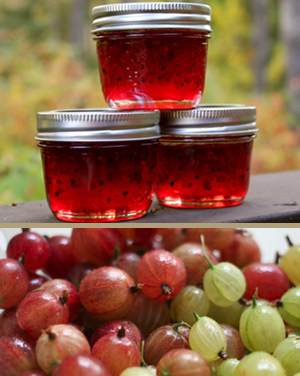 Clean and crush Gooseberries thoroughly. 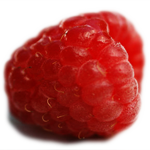 Measure prepared fruit into large saucepan. Stir in the pectin. Bring to a full rolling boil on high heat, stirring constantly. Immediately stir in sugar. Return to full rolling boil and boil for 1 minute, stirring constantly. Remove from heat. Stir and skim foam for 5 min. to prevent fruit from floating to top. Pour immediately into warm sterilized jars, filling to within 1/4 inch of rims. Seal while hot with sterilized 2-piece lids with new centres. Let stand at room temperature until set. Makes 10 (1-cup / 250 ml) jars. 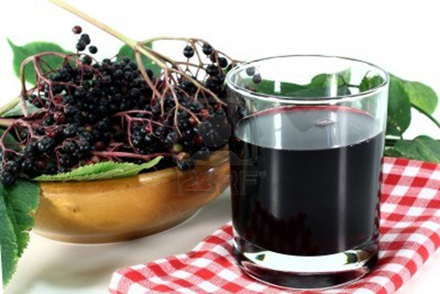 Clean and crush Elderberries thoroughly. Place in saucepan. Cook until juice starts to flow, stirring occasionally. Reduce heat to low, cover and simmer 15 minutes, stirring occasionally. Place 3 layers of damp cheesecloth or jelly bag in large bowl. Pour prepared fruit into cheesecloth, hang and let drip into bowl. Combine juice, lemon juice, and Certo crystals, bring to a full boil, add sugar and bring to a boil again - boil for one minute stirring constantly. Add the butter to reduce foaming. Pour in jars and seal. 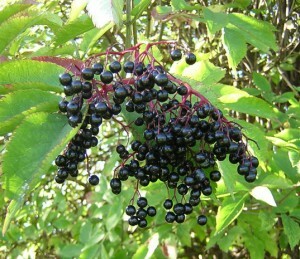 Elderberry Jam can be made also with Lantic Jam and Jelly Mix (in a carton like a milk carton). 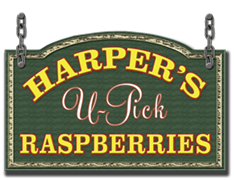 It's less sugar, but one may prefer jelly because of the seeds in the Elderberry Jam. Procedure: Completely dissolve honey and malic acid in 12 quarts of water in a suitable brew kettle and slowly bring to a gentle simmer. Turn off heat source. Skim and discard as much of the wax and surface film as possible (processed or filtered honey may not produce any film at all). Add frozen elderberries, cover and allow to cool. When liquid is below 90 degrees F. transfer to a primary fermenter, add yeast, and attach lid and air lock. Ferment for one to two weeks. Transfer to a glass carboy secondary, removing elderberries at this point using a funnel screen or mesh bag, add nutrient and enough water to fill near the carboy neck. Secondary fermentation may take two to four months due to the initially high starting gravity. When fermentation has completely stopped, rack into a clean glass carboy, leaving yeast sediment behind. Allow mead to clear naturally or add finnings if you wish and bottle when completely clear and stable. Note: The E1118 Yeast is very important in this recipe for its very high alcohol tolerance (18%). Using a champagne or other yeast will not produce the same results. The finished Mead should have a distinctive honey aroma, but with a slight sweetness and a very pronounced Port character. 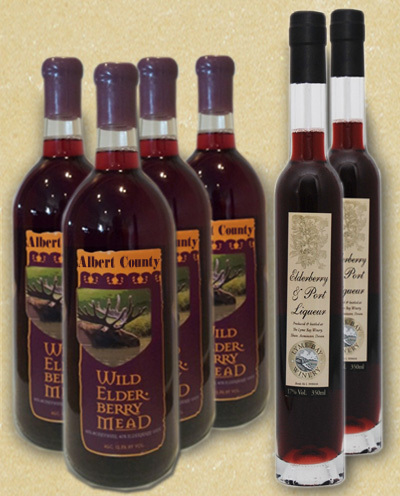 This Mead gains its high tannin content from the elderberries, which means it should age very well.